Bedford Landing – ParkLane Homes has given its master-planned Fort Langley development real estate the charm and comfortable feel of living in a small town, while offering single-family townhouse and condominium homes. Published from Westcoast Homes and Design by the Vancouver Sun to promote this pre-construction development. Masterplanned communities have much to offer: architectural continuity, sense of community and convenience. But for some home buyers, such communities have also been associated with cookie-cutter homes that are virtually indistinguishable from each other. Fortunately, forward-thinking developers such as ParkLane Homes are determined to change this stereotype with such new communities as Bedford Landing in the Fraser Valley in Fort Langley. The classic Arts and Crafts architecture of Bedford Landing by ParkLane Homes has been painstakingly planned, right down to the mature landscaping and fencing, all in the effort of creating a classic neighbourhood feel. Interiors, with the open-concept floor plans and light-filled windows, are modern and luxurious. Features include modern gourmet kitchens with stainless steel appliances, maple Shaker cabinetry, and granite islands. Bathrooms have soothing soaker tubs and separate showers, and main living areas come with cozy gas fireplaces. Berber or modern shag flooring and handset tiling in the entryways are also standard at the Fort Langley Bedford Landing single-family homes. The streets of Bedford Landing were also purposely designed with lane-access garages. “This was don’t so that you don’t see a bunch of garages along the street and it allowed us to really make a striking impact with the streetscape,” notes Woodhall. Most importantly, a home in Bedford Landing Fort Langley means having the peace of mind that comes from purchasing a Parklane Home, from one of B.C.’s most respected homebuilders. With unprecedented access to the waterfront, public parks, the Fort-To-Fort walking trail and Fort Langley’s vibrant centre, Bedford Landing is clearly finding appeal to homebuyers young and old: to date, more than 150 homes have been sold in the community in record time. ParkLane Homes is currently selling homes in its Cedarmill phase, a collection of three and four-bedroom homes in the heart of Bedford Landing. This fall, a major launch party, the developer plans to unveil Greenway, a limited collection of larger luxury homes backing onto greenbelt. Prices for the townhomes at Bedford Landing in Fort Langley start at $499,900 and at $624,900 for the single-family homes. For more information visit www.bedfordlanding.com, phone 604.888.2176 or drop by the sales centre at 23015 Billy Brown Road in Fort Langley between noon and 6pm daily. Fresh off the printers from The Bedford Times Fort Langley BC newsletter – providing the latest news and events for Fort Langley and its newest real estate pre-construction community Bedford Landing. ParkLane Homes introduces Waterfront condos, an exciting collection of charming riverside new Langley apartments coming soon to Bedford Landing. Updated August 2009 - Waterfront Apartments at Bedford Landing – Now Over 70% Sold Out! The largest suites at the Bedford Landing Waterfront real estate development condo building have the largest views. Newly released, these pre-sale Fort Langley condo homes for sale feature extraordinary water view apartments that are selling from the mid four hundred thousand dollar range, representing great value for waterfront homes in the Lower Mainland. Imagaine waking up to this extraordinary water view every day! In your spacious twelve hundred and fifty square foot Waterfront Home at Bedford Landing Fort Langley real estate development, it’s a given feature! With oversized decks and expansive einwods, you’ll be able to savour this spectacular waterfront setting from just about every angle. And the best part is you can now move into your new home at the Waterfront Condos at Bedford Landing at the end of this year. Come see for yourself and visit the fully furnished Bedford Landing Waterfront display suite today. Featuring one and two bedroom plus den apartment layouts from 690 to 1300 square feet, the presale Fort Langley Waterfront Condos at Bedford Landing are exclusively for adults aged 45 and older. The Discover Centre and Fully Furnished Display Suite for Bedford landing community is open daily from 12 to 5 at 9275 Glover Road in Fort Langley. ParkLane Homes presents Waterfront at Bedford Landing – an exciting collection of heritage-inspired apartment residences in pre-construction Langley real estate offering design excellence and extraordinary views of the river. Designed exclusively for active adults, Waterfront at Bedford Landing in Fort Langley BC real estate will complement the existing and completed Bedford Landing community while also providing much anticipated new housing option. Taking its stylistic cues from the unique waterfront location and the charming architecture of Fort Langley, Waterfront at Bedford Landing will offer thoughtful design in every detail. Outside, inspired architecture and a rich palette of materials and treatments reflect Fort Langley’s heritage past. One locat inspiration, is the red pumphouse at Bedford Channel. Originally a part of the former cedar mill, its purpose was to pump water from the river in Fort Langley real estate in the event of a fire on site. Now a charming remant, the hallmark red corners of the apartmenet pre-construction Waterfront Fort Langley condos will pay homage to the pump house and the vibrant red colour found throughout this town. The use of rough hewn and refined wood on the façade also recalls the historic mill site at Bedford Landing in Fort Langley real estate and the wood features that are still prominent on key local buildings int own. While designed with a scale and texture in keeping with the Fort Langley real estate market, Waterfront condo apartments at Bedford Landing looks to the future with modern apartment pre-construction design, a lively streetscape with lots of street front entrances, stoops, extensive overhangs for rain protection and other innovative and interesting design elements. Inside, the generously sized pre-sales Fort Langley apartments at Bedford Landing Waterfront range from one bedroom to two bedroom and their high ceilings, large windows and balconies allow maximum enjoyment of the stunning natural setting. All pre-construction Waterfront apartments at Bedford Landing have features supportive of active adult living and 10% will be specifically designed for ease of accessibility. Waterfront apartments in Fort Langley’s Bedford Landing community also features an amenity facility offering a fitness room, a reading room, and access to Riverside Park. For a preview, visit the new Bedford Landing Discovery centre on Mavis Avenue (just west of Glover). Occupancy for the Waterfront at Bedford Landing Fort Langley real estate condos is expected to be in late 2009. For priority registration, please visit www.bedfordlanding.com or call 604.888.2176. “I like the higher-density plan. Any community needs places where seniors can live when they are ready to give up their single family home, and ParkLane builds quality houses!” Fort Langley resident, Jenny Lewis Ave. “Awesome concept!! We thoroughly enjoyed being owners in this development. We support, in every way, this future proposed development. Our heart is to pursue ownership in one of these gorgeous units. Thanks for the memories in the makin!” Fort Langley resident, Billy Brown Rd. “I have lived in Langley for approximately 6 years and am looking forward to the construction and possible purchase of the 4th floor units [at Bedford Landing’s Waterfront condos].? City of Langley resident, 48th Avenue. “Love the look and layout. It willb e a great addition to the [Bedford Landing] development.” Fort Langley resident. “I would like to see apartments in Fort Langley. I am a senior and would lke to be able to stay in my area.” Fort Langley resident, Glover Rd. New Bedford Landing Waterfront Condo Presales Homes Released this Saturday! Join us at ParkLane’s Bedford Landing in Fort Langley real estate this Saturday from 12 noon to 6pm as we release the additional single-family waterfront homes in our popular Cedarmill and Greenway series. There has been a tremendous amount of advanced interest, so you’re encouraged to arrive early for the best selection as these pre-construction Fort Langley homes will sell quickly! Cedarmill at Bedford Landing offers 3 and 4 bedroom single-family homes with an excellent selection of traditional and great room designs, all with contemporary finishings and spacious basements for additional storage. Enjoy Fort Langley's Bedford Landing Cedarmill’s exterior finishes, rear garages and carefully planned landscaping and fencing that create the appealing streetscape. Value priced from $629,900. The Greenway collection at Bedford Landing in Fort Langley real estate market features luxury pre-construction homes ideally located on a lush greenbelt. These executive 3 and 4 bedroom homes offer 3,500 – 4,000 square feet of grand living space with designer finishes including coffered and vaulted ceilings, gourmet kitchens and spa-inspired ensuites with relaxing soaker tub. Value priced at Bedford Landing from $899,900. Bedford Landing is the only master-planned Fort Langley community next to a river, golf course and a thriving urban village in the Fraser Valley. This is the perfect time to buy your dream home in this award-winning Ft. Langley real estate community! Plus, we are also offering a Spring Celebration Promotion! For more information and to view our fabulous showhomes, visit the Sales Centre daily between noon and 6pm. We look forward to seeing you this weekend! The first new condominiums to be built in Fort Langley for many years, Baterfront is the newest pre-sales real estate phase at Bedford Landing, ParkLane’s award-winning, master planned community on the banks of the Fraser River. Offering 70 Fort Langley apartment homes at the Bedford Landing waterfront, plus eight riverside townhomes, Waterfront offers an adult oriented condo lifestyle with distinctly upscale features including KitchenAid Architect Series appliances, marble countertops in bathrooms, and a soaring West Coast inspired architecture. Don’t miss this rare real estate pre-construction opportunity at the Bedford Landing waterfront condos. For more info and to place your name on the priority list, stop in at the newly retrofitted and refurbished Bedford Landing Fort Langley discovery center for the Waterfront Condominiums located at 101-23242 Mavis Street (next door to Wendel’s Books and Fresh Food Café) in downtown Fort Langley. Waterfront at Bedford Landing is located at www.bedfordlanding.com or by calling 604.888.2176. Bedford Landing Block Party! Spring Promo Celebration On Now! Bedford Landing Community – How Far Along? People walking the Fort-to-Fort Trail along Riverside Park at Bedford Landing often have a common question: How far along is Bedford Landing in Fort Langley? ParkLane’s multi-phased building program began in 2006 with the single family and row homes pre-construction properties that occupy the majority of the site. The 84 pre-construction Bedford Landing ParkLane rowhouses are now sold out, and just over 50% are occupied. Close to 30% of the 183 single family homes in Fort Langley’s ParkLane community are occupied and 50% are yet to be released. In a nutshell, construction of the single family Bedford Landing homes is about half complete. Waterfront at Bedford Landing is the latest residential addition to Bedford Landing in Fort Langley real estate and pre-sales for the apartments will begin this year. Along with housing, ParkLane has undertaken many site improvements. The west conservation area with trails, viewing decks and landscaping is now in place. Two children’s play areas have been installed in the Fort Langley real estate neighbourhood as well as the public parking along the south boundary of Bedford Landing community. The installation of the pedestrian bridge completes the scrubber marsh and portions of the Fort-to-Fort Trail are in place along with the river viewing decks. The distinctive triangular piece of land south of Billy Brown Raod is now being planned for the next pre-construction Fort Langley Bedford Landing home release. The remaining mixed use area of about 1.2 acres at the east end of the site is being considered as part of the community – wide waterfront planning process. The Township of Langley has invited ParkLane Homes to participate in the Fort Langley waterfront study. There has been a long standing municipal goal to secure waterfront access along the river to link Derby Reach and Fort Langley; Parklane Homes is honoured to support this effort. The study area within Fort Langley includes a portion of Bedford Landing of 1.2 acres at the easternmost end of the community, as well as the Riverside Centre (Fort Pub building). The zoning now provides for a mixed use commercial and residential area connecting the Fort Langley real estate site to Glover Road and will also host the paddle sports facilitiy. The Fort Langley waterfront is a very special place, rich in history. It will host community events, paddling training and regattas, cultural and festival celebrations, tasty excursions and recreational amenities. Imagine being a Fort Langley or Bedford Landing resident, what would you like to see? Or a visitor to the waterfront of Bedford Landing, think abou the experiences you want to have. Consider these scenes you want to please: Sight. Sound. Touch. Taste. And let us know your thoughts! For ParkLane Homes, the waterfront Bedford Landing study is a highly valued opportunity to work with the community residents, businesses, recreationists, and visitors to ensure that urban design and land uses for this east section support Fort Langley’s broader goals. Recent research shows that one of the most important considerations for home buyers of new homes and pre-construction Vancouver condos is the track record of the builder. Before they make a decision – they want to know that the real estate developer is solid in every way. ParkLane Homes doesn’t fail to impress – since 1980, ParkLane has grown to become of the largest and most recognized residential builders in western Canada with a commitment to building excellence in every detail. The company has been recognized with over 250 provincial and national awards for real estate building excellence, including the Best Builder in BC and Canada awards. And early in 2007, ParkLane was honoured with the first ever, Platinum “Georgie” Award. This new real estate construction award was created to recognize Canadian Home Builder’s Association of BC (CHBA BC) members companies that have received 25 or more Georgie Awards. ParkLane Homes, developer of Bedford Landing in Fort Langley, has received 33 Gold Georgie Awards from 1992 – 2003 in addition to 70 silver recognitions. To date, no other BC company has been a recipient of as many Gold Georgie Awards as ParkLane Homes. With over 5,500 homes behind them – the organization is driven by a philosophy that every detail matters – from selecting the very best locations, to designing innovative homes for today’s lifestyles, to delivering one of the best customer service programs in the industry. This philosophy continutes to result in award-winning neighbourhoods by ParkLane Homes that offer exceptional value for years to come. ParkLane Homes (Bedford Landing) Ltd. The Bedford Landing and Waterfront Homes Discovery Centre is located at 101 – 23242 Mavis Avenue in Fort Langley BC and is open weekends from 12pm to 6pm. Call 604.888.2176 or visit www.bedfordlanding.com for more details. The Bedford Landing Sales Centre and Showhomes is open daily as well at 23015 Billy Brown Road in Fort Langley. For more details about ParkLane Homes real estate developers, please visit www.parklane.com. With unprecedented access to the waterfront of Fort Langley property, public parks, the Fort to Fort walking trail and Fort Langley’s vibran centre, Bedford Landing ParkLane’s master planned residential community is clearly finding appeal with homebuyers young and old. “Each time we have released more homes, we have had great response and I think this is due to the fact that Bedford Landing is truly a community for life,” says Marshall. In addition to Waterfront at Bedford Landing riverfront homes, ParkLane is currently selling homes in its Cedarmill phase a collection of three and four bedroom homes in the heart of Fort Langley’s Bedford Landing, as well as Greenway Series Homes, a limited collection of luxury pre-construction homes backing onto greenbelt. ParkLane Homes is currently accepting pre-registrations for Waterfront at Bedford landing riverside Fort Langley condo apartments, but emphasizes that with a limited number of pre-sale homes available, it’s important to register today. For more information, please visit www.bedfordlanding.com or call 604.888.2793 or drop by the Waterfront Condos Discovery Centre for more information. The riverfront Fort Langley apartment buildingat Waterfront Bedford Landing, which incorporates rich heritage elements, including beams from the site’s original cedar mill, features an open inner courtyard that is accessible to all who live there. The main lobby has a stunning stone fireplace and comfortable seating – an ideal setting in which to become acquainted with neighbours. Waterfront Fort Langley apartment residents wil also have access to their own private amenity building that features expansive floor to ceiling windows, and fitness, library and entertainment rooms. Inside each waterfront apartment, gourmet kitchens showcase stainless steel appliancs, granite counters and breakfast bars; elegant living rooms with engineered hardwood flooring and fireplaces promise cosy evenings; generous balconies invite outdoor living; and spa like bathrooms with soaker tubs and stone countertops will relax and refresh. Generously sized windows will afford spectacular river views to Brae Island an Brae Island Regional Park from each of the pre-construction Fort Langley Waterfront Apartments at Bedford Landing community. There’s also the peace of mind that comes with purchasing a pre-sale waterfront condo in an architecturally controlled master planned community built by one of the Lower Mainland’s most respected homebuilders, ParkLane Homes. When complete, Bedford Landing will feature a variety of home styles, including pre-construction Fort Langley single family homes, townhouses and apartment condominiums, abundant park spaces, and amenities such as a new public plaza, and wharf at the east end of the neighbourhood. The classic Arts and Crafts architecture of Bedford Landing Fort Langley master planned pre-sales community has been thoughtfully planned, right down to the mature landscaping and fencing, all in the effort of creating a classic neighbourhood feel. New Bedford Landing Homes Released this Saturday! New Fort Langley real estate offering at Bedford Landing Homes Released this Saturday, August 1st! Visit us this Saturday from 12 noon to 6pm at ParkLane’s award-winning Bedford Landing master planned community in beautiful Fort Langley property market, when we release additional pre-construction single-family homes in our popular Cedarmill and Greenway series. Don’t miss out on this rare opportunity! These pre-sales Fort Langley homes will sell quickly, so be sure to arrive early for the best selection which includes a limited number of E and F plans as well as a custom-designed home. Cedarmill Bedford Landing homes features spacious 3 and 4 bedroom presale residences approximately 1,700 to 2,600 square feet in size, with a choice of traditional or great room designs. Contemporary interiors at the Bedford Landing Cedarmill home release feature luxurious details such as beautiful handset ceramic tile; solid wood maple shaker cabinets with sleek chrome pulls; and roomy unfinished basements for additional storage and/or future growth. Value priced from $614,500. Nestled amongst lush landscaping against a backdrop of dedicated greenspace is the popular Greenway collection at Fort Langley Bedford Landing waterfront community, an exclusive offering of 3 and 4 bedroom pre-construction Ft. Langley homes with 3,500 to 4,000 square feet of grand living space. Stunning interiors in the Greenway Bedford Landing release of single family homes will define a new standing of luxury living, with special details including coffered and vaulted ceilings; gourmet kitchens islands; spa-inspired ensuites with relaxing soaker tubs; fully-finished basements and double car garages. Valued priced from $856,500. Set in a spectacular riverfront setting next to Fort Langley’s historic centre, Bedford Landing waterfront real estate community offers the authentic charm of a small town without compromising any of the benefits of a contemporary lifestyle. As a reminder, The Farmhouse at Bedford Landing is now open weekends from 12 noon to 6pm. For more information on this upcoming phase and to view our fabulous showhomes, visit the Sales Centre daily between 12 noon and 6pm. We look forward to seeing you this weekend! Sincerely, The Bedford Landing Sales Team or www.bedfordlanding.com. Is Surrey Central Real Estate District Ready for a $1.6 Billion Condo Development? If you believe that the Shangri-La Vancouver downtown high-rise will remain the tallest condo tower in the Lower Mainland for a long time, you may be wrong. A proposed $1.6 billion condominium master planned development in the Surrey Central real estate market is now garnering a lot of news and headlines. Even with the downward trend in condo sales (especially pre-construction sales) in addition to housing values, Berezan Management Ltd announced on October 30th, that the Surrey businessman has proposed a $1.6 billion development in the Central City Surrey real estate district. This master planned Surrey Central City community will consist of approximately four million square feet of space over ten acres of prime real estate and will have a mix of retail, office and residential space. There will be five proposed buildings with five phases fro eventual completion of the Surrey Central City proposed master plan. Not only that, one of the condominium towers proposed by Berezan Management Ltd for this Surrey Central City site is a 70 storey high-rise that will become the tallest condo tower residence in the entire Lower Mainland, making the Shangri-La Vancouver tower a dwarf like miniature. Located at Fraser Highway to King George, the Berezan Management Ltd plans to purchase this bare land at a fifty million dollar price tag eventual build out of its five planned phases. The Central City Surrey real estate community has been a hot area for pre-sale condo purchasers as well as investors and first time homebuyers. With the recent stalls in the Sky Towers and Infinity at Central Surrey (by a foreign developer), the Berezan Management Ltd proposal for the $1.6 billion masterplanned condo development will probably go forward and will take fifteen years to complete. Construction actually won’t start until 2011, which is about half a year after most of the current pre-construction and under construction condominium units will be absorbed by home purchasers, so the developer is confident that these condo tower residences in Surrey Central City real estate will sell quickly due to rising demands past 2011. In addition to the 70 storey high-rise tower, the Berezan Management Ltd proposal for the Central City Surrey real estate development will also include three other residential towers that will be between forty and fifty stories in heights in addition to a fifty five storey high-rise hotel and office tower. An attractive feature of this Surrey master planned Central City development will be housing set aside for assisted living and other affordable housing units for low-income individuals. Other features of the Berezan Management Surrey development will include public gathering spaces, greenery, entertainment and shopping mall in addition to luxurious suites. Two other large projects by Jung Development for the Central City real estate district have been delayed due to financing concerns (connection with Lehman Brothers in the United States). With Berezan Management Ltd looking to speak with the City of Surrey from now until late next year in regards to this Central Surrey condo development plan, they will also be seeking financing for construction starting in a couple of years. Although a few Lower Mainland condo projects have been either cancelled or put on hold, Surrey still attracts more than 1000 people per month into the city, so affordable housing and a range of housing types are still required to keep up with in migration. This proposed Central City Surrey condo tower residences will be one of the largest master planned communities in the history of the Lower Mainland. The Berezan Management Ltd company was last in the news for their bailout of the Hemlock Valley Resort ski community as they paid $3 million to receivership to assume control of this development. Get back to nature in the city. Premiere Series of Ethical Gardens includes 63 spacious condominiums. Site location is 10237 133 Street in Surrey, BC. Pre-Sale Location is in Days Inn at 9850 King George Highway at 12 noon on October 28th. One, one bedroom and den, two, two bed and den homes. Priority Register for Surrey’s Ethical Gardens condos today at www.egliving.ca or call 604.495.0205. Limited number of Ethical Gardens suites available. Located in Central City Surrey. Located in Westone Properties’ popular Urban Village, Ultra Condos is a master planned community’s first high rise tower. Soaring more than 35 storeys and offering a broad range of floor plans, the entire Ultra Urban Village bulidig will be built to LEED standards – so your new home will be beautiful and environmentally friendly as well. Each condo suite at Ultra Surrey pre-construction condos will be ready for future with fibre optics. An innovative Co-Op Car Share is also anticipated. Previewing begins this fall for VIP registrants only (invitation required). Be sure you’re one of the first to see this exciting new development at Urban Village Ultra Surrey condominiums by priority registering today at www.urbanvillageliving.com, then watch your mailbox for regular updates. I am happy to announce that you can now discover more detail on Sky Towers by visiting our website at www.skycentralcity.com. I encourage you to visit our website and see for yourself why Sky Towers is Central Surrey's superior highrise. 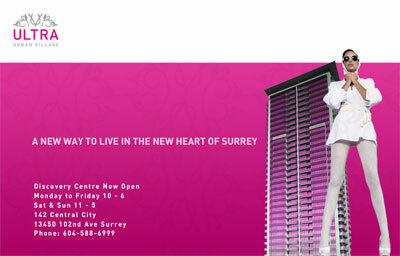 We are drawing nearer to our Sky Towers Central Surrey Condos VIP Sales Event on Sunday November 4th. (If you haven't already done so, now is the time to call to book your appointment) Should you have any questions, please do not hesitate to call. Our VIP Sky Towers sales event is set to launch this Sunday, November 4th and it is sure to be an incredible day for both Surrey Central City and many excited new home buyers. The response to Sky Towers has been phenomenal and for that reason we strongly encourage you to book an appointment. 1. Please have your top three floorplan choices ready. If you haven't already reviewed plans, please visit our website at www.skycentralcity.com. 2. Please ensure that you are on time, or even early for your appointment. 3. Please bring your cheque book. A deposit cheque will be needed to complete your home purchase at Sky Central Surrey. The Sky Towers Presentation Centre is located at 9887 E. Whalley Ring Road, behind the King George Sky Train Station. Click here to see a detailed location map. Parking on E. Whalley Ring Road is limited but alternative parking can be found beside the King George Sky Train Station or at the Central City Shopping Centre. These condominium units have come back to market after initial purchasers released their hold on the Central Surrey Sky Towers home. This can happen for a number of reasons, including inability to solidify financing and change of heart. The fact is that many of these homes are among the best that Sky Towers has to offer as they were selected very early in the selling process. With only 40 homes remaining this may be the final opportunity to own in Central Surrey's superior high rise. Feel free to contact me, or visit our Presentation Centre (open everyday from 12-5pm, except Friday) located on East Whalley Ring road, between 98th and 100th avenue. Nestled within the much loved Morgan Heights neighbourhood of South Surrey is where you’ll find Kaleden Townhomes, Polygon’s new family style townhouse community. This lively collection of townhomes features a seaside-style architecture, open floor plans with two to four bedrooms, gourmet kitchens, large decks, private fenced years, as well as one of Polygone’s signature club houses complete with outdoor swimming pool, spa, fitness studio, and movie room. The Kaleden South Surrey Townhomes have easy access to the award-winning Morgan Creek Golf Course, an abundance of schools including Southridge private school, and a host of new shops and services. Sales for the townhomes at Kaleden Surrey are expected to begin this fall. To ensure you’re among the first to hear more about the new real estate presales community, priority register by calling 604.871.4191 or on the web anytime at www.polyhomes.com. Urban condominiums coming to South Surrey. Morgan Crossing features one, two and three bedroom condominiums in Canada’s first premiere residential, retail, lifestyle community form the Developers of the Village at Park Royal. Coming fall 2007 and you can priority register for South Surrey’s Morgan Crossing condos today at morgancrossing.ca or calling 604.582.1336. GRAND OPENING CELEBRATION WEEK | Morgan Crossing has continued to have tremendous success since the Grand Opening on October 20, and is being embraced as South Surrey's best condo value. Starting on Saturday, November 17 and lasting until Saturday, November 24, Morgan Crossing will be hosting a Grand Opening Celebration Week. During the Grand Opening Celebration Week, Morgan Crossing South Surrey is offering an exclusive bonus to registrants - the first 20 purchasers at Morgan Crossing will receive a $3000 credit* to decorate their new home. Morgan Crossing offers the best value in South Surrey today with solid granite and marble countertops, stainless steel appliances, washer and dryer, rich hardwood laminate flooring, and cozy fireplaces - all included in the price of your home. Take advantage of Morgan Crossing's Grand Opening Pricing. Visit us today to view our 2 full display suites and learn more about Canada's premiere residential-retail-lifestyle urban village. Morgan Crossing - Park Royal Shopping Spree: Enter to win right now! With your help in filling out a very short survey you will become eligible in our draw to win one of two $500 Shopping Sprees at Park Royal Shopping Centre & Park Royal Village in West Vancouver. The South Surrey Morgan Crossing community draw will be held on Monday, March 3rd at 5:00pm. Make sure to follow the link below, answer the quick and easy 11 questions and click submit so you don't miss out! We are always looking for ways to make Morgan Crossing Surrey master-planned community an even better place to live, so we thank you for your feedback and continued interest. Best of luck in our draw! Capturing the essence of city living, High Street at South Point is a limited collection of fashionable flats and townhomes set in a vibrant, pedestrian-friendly village on the Semiahmoo Peninsula. Conveniently surrounded by shops, services, cafes, restaurants, and more, High Street at South Point has all the prerequisites for sophisticated urban living minutes from the beach. Don’t miss your chance to get in early. Urban. Class. 1 + den to 3 bedroom spaces. Register today for the South Point High Street town homes online at southpointlife.com or calling 604.536.9333. Complete urban palette. You can visit this link for more information about South Point High Street Townhomes and Condos in South Surrey. Thank you for your interest in High Street at South Point. I am very excited to announce we are now booking appointments to showcase the designer homes at High Street. Our Presentation Centre will be open daily, if you prefer, from 12 noon until 6 pm everyday except Friday. I am also providing you with our High Street website www.southpointlife.com for the latest information on High Street. Inside each home, High Street Townhomes and Condos offers warm contemporary interiors including a designer Whirlpool stainless steel appliance package, stone countertops, wood cabinetry, undermount sinks, designer faucets, beautiful fireplace with TV niche above including hidden wire management system and so much more! Proudly developed by Grosvenor, with over 300 years of experience, High Street at South Point is sure to impress as no detail has been overlooked. Floorplans aren’t always the easiest things to understand, but this three bedroom version pretty much speaks for itself. Of course, it’s hard to hear the superior construction quality or see the Frank Lloyd Wright inspired architecture. So do yourself a favour. Register today for the Tehama condo residences in Surrey, and get ready to live with a floorplan that finally makes sense. Priority register at www.tehama.ca or call 604.542.9901. The South Surrey Tehama condominium homes are located at 3355 Rosemary Heights Drive. Plan B as an example floorplan at Tehama consists of three bedrooms with 1381 square feet interior space and a balcony of 455 square feet. According to Susan of the New Home Buyers Guide: You know what you want. It’s quite simple actually. You want a home that’ sunabashedly upscale, distinctly West Coast savvy, and situated so you’re close to all the amenities and recreation you treasure. No problem. Introducing Surrey’s Tehama condos and townhomes, a new condominium residence in South Surrey real estate. Brought to you by the Dawson Lakewood Group, the same company real estate developer who built the Gold Georgie Award winner, The Wedgewood in nearby Morgan Creek, South Surrey Tehama Condos and Townhomes combines the quality you come to expect from this family owned company with a fresh, urban outlook on life. Just the thing for anyone who’s not willing to accept compromise. A neighbourhood like no other, the Tehama South Surrey real estate condo presales is absolutely gorgeous with their presentation centre now open. Comfortable, urban chic and beautifully finishes, the Tehama condo pre-construction South Surrey real estate development is all about home. Tehama South Surrey is not only the first condominium residence, it’s the last new real estate development in this prestigious neighbourhood. AT the site, construction of the presales South Surrey Tehama condo residences is in full swing and you can actually see how the residential building staggered exterior has an almost rhythmic feel to it with timber and ledgestone accents. Tehama Surrey condo pre-construction sales offers only thirty seven 2 and 3 bedroom executive condominium residences ranging between 900 to 1382 square feet and they are priced from the mid $300,000s to the mid $500,000s. Tehama South Surrey real estate is located at 3355 Rosemary Heights Drive. Inspired by Nature and Designed in Harmony. Come see, feel, and touch the quality features and finishes at Tehama Surrey condominium apartment homes. You will appreciate the interior finishes as well as the exterior craftsman style inspired by architect Frank Lloyd Wright whose designs harmonize flawlessly with nature. Nestled in the centre of the prestigious and quiet Rosemary Heights neighbourhood of Surrey real estate, stroll the surrounding trails bordering Morgan Creek Golf Course and walk to shops, all within minutes of your new Surrey Tehama home. This successful community at Tehama apartment homes in Surrey rela estate is selling quickly. Visit our show home suite today. Now ist he time for you to come and see how you can live in abundance. Limited number of single level Rosemary Heights Surrey Tehama condominiums are available right now from 900 to 1400 sq ft priced from $334,700. Substance and style from only $657 per month (limited time offer, see sales staff for details). Own in desirable Rosemary Heights South Surrey real estate market at the Tehama homes. Two and three bedroom condo Surrey houses for sale with Frank Lloyd Writght inspired architecture. Spacious floor plans, quality finishing throughout and Morgan Creek location close to golfing, trails and shops, you can now move into your new Tehama Surrey house today! Model home is now open noon to 5pm daily (but no Friday) at 3355 Rosemary Heights Drive, Surrey or you can call 604.542.9901. Brought to you by the Dawson Lakewood Group, The Surrey Houses at Tehama (an American Indian word meaning abundance of nature) is tucked into an existing Surrey subdivision and bordering onto Rosemary Trail. This is the last property that will be developerd here – so Tehama Surrey condo homes for sale is not only the first condominium residenc here, it’s the last new real estate development in this prestigious neighborhoood. The design of the pre-sale Surrey Tehama condos are sleek, sophisticated and with the crisp minimalism you’ve come to expect in from an urban savvy, luxury residence. Tehama Surey condos for sale offers a selection of executive condominium homes ranging from 900 to 1382 square feet. The new Tehama presentation centre is located at 112 – 15350 – 34th Avenue in sunny South Surrey real estate market and is open noon to 5pm daily but closed Fridays. For more details, please visit www.tehama.ca or call 604.542.9901. As with a multitude of other Lower Mainland real estate developments on hold or cancelled, the SkyTowers Surrey condominium development is also not put on hold. With a foreign developer who hoped to be the largest Greater Vancouver condo developer, the Surrey SkyTowers condos are now on hold and temporarily stalled until the next rise in real estate interest hits the Surrey market. Building Infinity Surrey condos across the street from SkyTowers, this master planned Surrey condo community will stop all construction and pre-sales marketing for their developments until further notice. In addition, the same foreign developer has also now place the Infinity Surrey condo towers on hold as well. Construction is now delayed and pending, meaning that there is no definite timeline for completion of the almost finished Surrey Infinity condominium tower residences nor the SkyTower condos in Surrey real estate market. Right now, there is a lot of uncertainty surrounding the Lower Mainland real estate market, and with both the pre-sale Infinity Surrey condos and the SkyTower condominiums on hold now, this creates even less consumer confidence in the near future. It is not clear when and if the SkyTower and Infinity Surrey condos will start again or if they will even be completed. Located at 100 Avenue at E. Whalley Ring road in the Surrey real estate market, the Sky Towers presents 901 units to the market by Jung Developments Inc. Although both Sky Tower condo high-rises have been completely sold out, no construction work has actually started on this project that is on hold now. With credit crunch problems and financing issues, there is a possibility that these sold out SkyTowers in Surrey real estate market may not even break ground. Stay tuned for more information. Luxury Surrey condo living for less money in South Surrey Tehama condominium residences and save up to $130,000 if you buy now! Incredible values don’t get any better than this prestigious Rosemary Heights Surrey real estate neighbourhood. Quiet, private and spacious with quality finishing throughout and move in now! Only three pre-sale Surrey Tehama condo suites remain! Suite 212 (Type A2 floor plan) of 1,030 is now priced at $329,900 from $412,900 while Suite 104 at the Surrey Tehama Rosemary Heights condos Type C1 at 1,156 square feet is priced at $379,900 from $469,900. Lastly, Suite 108 at the pre-sale Surrey TEhama condominium residences is priced at $449,900 from the original $579,900. Located at 3355 Rosemary Heights in South Surrey real estate market. Cloverdale Real Estate Deals at Augusta Townhomes! The best pre-sale townhome value! Compare our homes at Augusta Cloverdale townhouses to other communities and see why our value is so exceptional. With three bedroom and den Cloverdale homes for sale around 1646 square feet starting from just $319,000, the spring event here at Augusta Townhomes is now on! Featuring granite kitchens, gas fireplace and furnace, five appliances included in addition to 2 inch blinds included with your pre-sale Cloverdale home purchase at Augusta Townhomes, now is the time to purchase a new Cloverdale real estate property at bargain basement pricing. Also included are 2.5 to four bathrooms with powder rooms on main floor in the floorplans, lots of parking, low density neighbourhood with 15 units per acre compared to most other 25+ per acre communities in Greater Vancouver in addition to a selection of four floor plans ranging from 1485 to 1948 square feet in size. There are also large private fenced yards off the main floor here at the pre-construction Cloverdale real estate development and the new pricing for these Augusta Cloverdale townhomes starts from $319,000 up to only $399,000. There are presently two show homes available for viewing from 1:00 to 5:00 pm except both Thursday and Friday at 18199 70 Ave in Cloverdale real estate and the Augusta Townhouses are brought to the market by Vesta Properties. Located at 13618 100 Ave in Surrey real estate market, the one thousand four hundred unit Infinity condominium towers by Jung Developments Inc. is not officially on hold. Marketed as the largest real estate development in Surrey ever, Jung Developments has not filed for protection from creditors and sought major refinancing for its Surrey Infinity condominium tower residences. The first condo tower at Infinity Surrey has already been completed and occupancy has happened already. However the remaining two pre-sale Infinity Tower condos are still under construction (they have zoning approval), but no condominium units have come onto the market just yet. MAC Marketing Solutions has handled the pre-sale advertising and marketing for the Surrey pre-construction Infinity Tower condos and says that another $100 million is required for Jung Developments Inc. to complete the two condominium high-rises. In addition, the timelines for the two remaining towers will likely be lengthened to an eventual completion of another year. However, for most interested parties, this is the least of their worries, as there is a possible termination of the two Surrey Infinity condos put on hold if the refinancing does not come through. Sky Towers is now down to its final 30 remaining units. With over 870 units sold, Sky Towers Surrey remains the most prominent project in Central City. Many of the remaining 30 homes are among the best that Sky Towers has to offer as they were selected very early in the selling process and have since come back on the market. There has been steady activity at the Surrey's Central City Sky Sales Centre over the last few weeks. With only 30 homes remaining this may be the final opportunity to own in Central Surrey's superior high rise. Feel free to contact me, or visit our Presentation Centre (open everyday from 12-5pm, except Fridays) located on East Whalley Ring Road. Due to construction on East Whalley Ring Road, the best way to access the Presentation Centre is via Fraser Hwy. What an amazing start to 2010! With the Winter Olympics right around the corner it's time to celebrate with a great opportunity at Exchange Vancouver lofts for sale. Enjoy the lifestyle, create your living space, give in to your creativity, love coming home. You've waited long enough and with fresh new 2010 Vancouver condo pricing and record low interest rates, there's no better time to buy. BUY BEFORE MARCH 21ST AND SAVE UP TO AN ADDITIONAL $15,000 ON SELECT SUITES* Here are just a few examples of the new Vancouver homes for sale you can choose from: Exchange Vancouver Loft 208 is a one bedroom with B3 layout and 507 sqft facing South priced at an incredible $349,900. The Unit 212H at the new Vancouver Exchange lofts fors ale is a one bed A1 plan with 629 square footage facing west and priced at an affordable $419,900. The Unit 210H at Exchange Vancouver lofts for sale is a unique 1 BEDROOM + FLEX unit B1 layout with a spacious 803 sq feet in living space and south facing with a price point at $479,900. Also available at the new Vancouver Exchange Lofts is Unit 315H which is also a one bed plus flex room and is 774 sq ft facing North with the A2 plan and priced at $559,900. Suite 504 at the affordable Vancouver Exchange lofts for sale is the two bedroom E3 floorplan that is eight hundred and seventy square feet facing south and priced at $659,900. Unit 603 at the False Creek Exchange Vancouver lofts for sale is also a two bed with the same floor plan as above with 863 sf and priced to sell at $669,900. The last featured suite 211H at the Southeast False Creek Exchange Vancouver lofts is the D2 plan with an incredibly large 1,429 sq ft floorplan facing SW and is priced at $759,900. 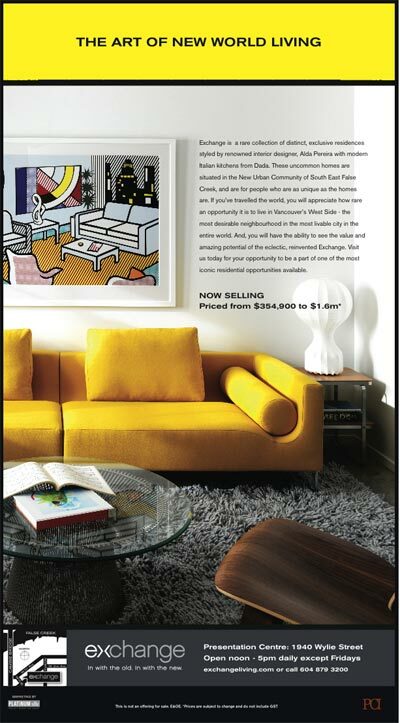 More of the new 2010 Vancouver condo pricing is now available through the sales team and online. YES WE'RE OPEN - PARKING AVAILABLE! Visit the new Southeast False Creek Vancouver Exchange Lofts fully furnished and completed display suite. We are located at #113 - 388 West 1st Avenue (at Wylie Street) and open daily 12-5PM, closed Fridays. Free parking is available. For more information about the new Exchange False Creek Vancouver lofts for sale please contact us at 604.879.3200 or online at exchangeliving.com. See you soon! The Exchange Vancouver Condo Sales Team *We are open during the Olympic Games! #113 - 388 West 1st Avenue, Vancouver, BC | t. 604.879.3200 | f. 604.708.6463 | e. info@exchangeliving.com. *Some conditions apply. Prices and availability are subject to change without notice here at False Creek Vancouver Exchange lofts for sale. Please speak to an Exchange Sales Agent for more information E.&.O.E. With 27 units sold already, the Vancouver Maguire Condos are a hot commodity. At the Maguire Building Vancouver condos located at 2665 West Broadway, there are only eight two bedroom condominiums remaining. There are three floor plans to choose from between 1183 and 1376 square feet in size. The West Broadway Maguire Vancouver condos feature open kitchens with arched dormer windows, fireplaces, some expansive balconies and in suite laundry. Also, there are two parking stalls per unit and a bike room, storage space and views. This concrete constructed condominium building at the new Vancouver Maguire Condos also features the balance of the 2-5-10 year new home warranty. Remember, there is no GST on these new units and they are priced from $599,900 right now. More info on the Maguire Vancouver Condos is located down this page. History Repeats Itself at False Creek Vancouver Exchange Lofts for Sale. Built in 1913. Move in This October 2009! Modern living in a historic brick and beam building here at the Excahgen False Creek Vancouver lofts for sale are now available. A home where a sense of history meets the new North Cambie Village neighbourhood of Vancouver real estate market. Whole Foods, Winners, London Drugs, Canadian Tire and the Skytrain Canada Line Station just steps away. 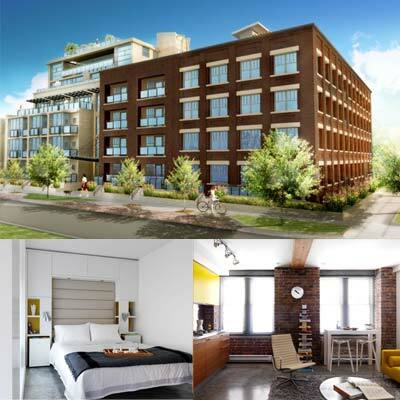 The Exchange Vancouver lofts for sale in North Cambie False Creek real estate market are now here with original brck finishes, wood beams, AEG appliance set, Dada kitchens and exposed concrete floors. Visit the Exchange Vancouver loft fully furnished and completed display suite today for more information at #111 – 388 West 1st Avenue, Vancouver. They are open daily from 12 to 5pm and closed Fridays. The new False Creek Exchange Vancouver lofts for sale are now priced from $385,900. Visit exchangeliving.com for additional information or call 604.879.3200. Brought to you by Rennie Marketing Systems and built by PCI. We have great news to share with you! With the end of the Vancouver City Strike, PCI, the developer of Exchange Lofts is now ready to proceed! To thank you for your patience over the past few months, the developer has agreed to release a handful of suites this Fall. Since the official Vancouver Exchange Lofts opening is still scheduled for Spring 2008, this truly is a priority invitation to get in first at this historic and boutique development. In the coming days, we will share with you more information via e-mail including: the Exchange Loft rendering, draft floor plans, features and finishes, and price ranges. We will also send you more details on how to secure your purchase opportunity as soon as early November! Our spectacular display loft suite, which is located within the Exchange condo building is also nearing completion and will be ready for you to view within the next few weeks. As a reminder, this is a very early opportunity to be among the first to own at Exchange condominiums in the exciting Southeast False Creek Neighbourhood. All other Exchange sales events will be conducted in early 2008, therefore, please express your interest quickly for the early first release by replying to this e-mail. You can also expect a phone call from us within the next few days to discuss these updates, and answer any questions you may have. Platinum Project Marketing Group, Macdonald Realty Ltd.
Exchange Lofts Preview Event Coming November 8th! Further to our e-mail last week, we are pleased to share with you the next steps in owning at Exchange! We have attached a selection of floor plans for your review. Due to the wide variety of floor plans at Exchange, we have attached those that are most representative of many of the other styles at Exchange. Click here to download the Exchange Lofts floorplans in pdf. You’ll discover that the suites are highly functional, ranging from 441 to 1,619 square feet and all have over-height ceilings. You’ll also see that each of the floor plans indicate whether the plan is located within the original heritage building, or if it is located within the new, heritage-inspired concrete-constructed building. We encourage you to review the Exchange floor plans carefully. Corresponding price ranges will be released later this week by e-mail. Should you need assistance in selecting your suite preferences or are interested in a Exchange Penthouse suite, please contact us directly at 604-879-3200. Click here to view the Exchange Features & Finishes list. From the exclusive Italian-imported Dada Kitchen Systems to high-performance appliances, Exchange Condo finishes have been carefully crafted by Vancouver’s award-winning interior designer, Alda Pereira. Please accept our invitation for the first private preview event at the amazing Exchange Condominium Presentation Centre and fully furnished heritage loft suite! At this event, we will be announcing how you can secure your priority appointment to purchase a suite, starting on November 10th. We are pleased to share with you the starting prices at Exchange. In our last e-mail, we provided you with a selection of eight floor plans for Exchange Loft Condos in False Creek Vancouver. These same floor plans have been updated with the starting price on each corresponding suite. CLICK HERE to view the floor plans in pdf with the starting prices*. Exchange Heritage Building (Units 110, 213, 313) are Type A1 floorplan between 643 - 647 square feet (1 bed open loft) starting from $514,900. and Units 107, 210, 310, 410 are Type B1 floor plan at False Creek Exchange Lofts and are 818 sq ft (1 bed open loft + flex) and they start from $609,900. The new Exchange Building Type C3 1 bedroom open lofts between 579 to 588 sq ft are $414,900 and the Type C4 Exchange floorplans at 441 sq 1 beds are from $334,900. The luxurious 2 bedroom + nook condominiums at Exchange False Creek will be 1619 sq ft in size and will start from $1,314,900 and Type D2 at 1399sq ft from $1,127,900. The Exchange penthouse 2 bedroom plus den floor plan is 870 sq ft and starts from $719,900. If you have questions regarding other floor plan styles at Exchange Lofts, please contact us immediately at 604-879-3200. Due to the number of phone calls we have received, we encourage you to leave a message and your call will be returned promptly. As a reminder, we are hosting an exclusive preview event this Thursday at the recently completed False Creek's Exchange Presentation Centre and Display Suite! We will have many sales associates on hand to answer any questions you may have. If you have not already RSVP’ed, please do so before Tuesday at 5pm. We will be providing more information at the event on how to purchase at Exchange Condos, starting as early as Saturday, November 10th, our first limited release! *All prices are not inclusive of GST and are subject to change. The prices reflected herein are for the special first release program. Exchange Sales Team, Platinum Project Marketing Group, Macdonald Realty Ltd. Introducing a boutique collection of only 12 homes with remarkable 360-degree views. Experience everything a discerning home buyer would expect from opulent living – and many spectacular extras beyond your imagining at the Kerry Kerrisdale townhomes in Vancouver. Spacious living in exclusive full floor home design and the Kerry townhomes also have direct elevator access to your private foyer, classic architecture with warm limestone columned exterior and a formal, welcoming landscape with flowrering water feature. Unique concrete townhomes in Kerrisdale at the Kerry from $1.3 million and full floor Kerry homes in Vancouver from $2.375 million. Now selling by private appointment only. For more information, please call 604.871.1522 or visit www.thekerry.ca. Marketed by Re/Max Ken Leong and Developed by DR3 Developments. The Maguire Building at 2665 West Broadway includes 36 spacious 1 and 2 bedroom condominiums. Concrete construction and 2-5-10 warranty. Come live at the centre of Kits at The Maguire Building condos. For more information please call Michael Bertrand at 604.263.8800. This is not an offering for sale. Please visit www.maguireliving.com for more information about the Maguire Condominiums in Kitsilano. The Maguire building in Vancouver is now an incredibly valued complete condo development in the heart of Kitsilano witih ongoing viewings. All new lower pricing is now available for the Vancouver Maguire Kits condos and there are only twenty six remaining apartments that are very spacious. They offer one and two bedroom suites and provide the best value in all of Kitsilano. Coming soon to the Kitsilano property market are the renovated suites at the Maguire Building Vancouver. Not considered a pre-sales condo development, the Maguire Building condominiums are available for purchase and move-in straight away, so there are no waiting times or delays. Located in the center of the Kitsilano real estate market at 2665 W. Broadway, these four year old concrete residences have a European construction and provides spacious one and two bedroom Kits condos from 815 to 1375 sq ft. In all, the Maguire Building in Kits property market offers only thirty six renovated suites and there are sixteen different floor plan layouts available. As mentioned above, a purchase at the Kits Maguire Condos will not have GST. You cannot find this value in Kits real estate anywhere, so with only a handful of units still remaining for sale, do not hesitate to contact Michael for more details about pricing and availability of floorplans. Housing sales across Greater Vancouver increased 10.2 per cent in September, compared to the same month last year, while listings of homes for sale stayed fairly stable, with a 4.1 per cent increase, reports the Real Estate Board of Greater Vancouver. Total sales last month reached 2776 units, while listings real estate totalled 45,054 residential properties. “There is no single demographic of home buyers. They include first-time buyers, people choosing to take advantage of current home equity to ‘move up’ in the real estate market, as well as people coming into greater Vancouver from other areas. Our data indicates that the majority are purchasing a primary residence,” said REBGV president Brian Naphtali. “There’s a great deal of choice in the real estate market for a range of consumers today,” explains Naphtali. “While 45 per cent of homes for sale are priced at below $500,000, there are also a significant, 37 per cent, listed in the $500,000 to $1 million range. Of the active listing investory of more than 11,000 residential properties approximately 18 per cent are priced above $1 million.” According to Multiple Listings Service data, sales of apartment condominiums in Vancouver increased by 7.7 per cent to 1,188 sales in September 2007 compared to September 2006. The benchmark price of a condo apartment in Greater Vancouver is $371,718 up 11.1 per cent from one year ago. Sales of townhomes increased by 27.6 per cent and the benchmark price is $452,944, up 10 per cent from a year ago. Sales of detached homes increased by 6.3 per cent and the benchmark price of hit $737,927 up 11.9 per cent from last year. Starting this Saturday October 20, the Greater Vancouver Home Builder’s Association is presenting its sevnth annual Fall Parade of New Homes throughout the Lower Mainland, showcasing the latest in construction technology, building products and services, interior design and more. The parade ends October 28. Thirteen builders will show their best at 23 homesites in 11 Lower Mainland municipalities. Parade hours are Monday to Thursday 1-5pm and Saturday/Sunday noon to 5pm. Admission is free. Included are single-family houses, townhomes, duplexes, and low-and tower condominiums. Watch for the red “We’re on the Parade” signage at each participating builder’s homesite. Corporate sponsors include the Homeowner Protection Office and Shaw Cablesystems. Full details are available at www.gvhba.org. Exchange: First Sales Start Saturday! Thank you to all who attended the very first preview of the Exchange Presentation Centre and Display Suite yesterday afternoon. We enjoyed meeting many of you and enjoyed the amazing response for true heritage loft living in Southeast False Creek. At this event we advised on the next steps to own at Exchange. Sales for Exchange will commence on Saturday, November 10th at 10am. All sales will be conducted on a first-come, first-served basis. Based on the volume of registrants, we anticipate a very large turnout and therefore ask that you arrive early, and dress for the weather. Doors will open at 10am sharp, and parties will be allowed entry as sales people becomes available. We ask you to kindly review and adhere to the following steps to ensure that all interested parties are assisted in a fair and prompt manner. If you require financing assistance to purchase your new home at Exchange Condo Lofts, we recommend that you contact one of our Residential Mortgage Managers to obtain a mortgage pre-approval before Saturday. TD Canada Trust and VanCity are offering an exclusive rate cap (they will secure your interest rate until completion) and financing incentives to Exchange purchasers. Due to the limited release of suites, we kindly ask that you select a minimum of three preferred Exchange condo floor plans. Although we will do our utmost to accommodate your requests, we will not be able to guarantee suite or style availability. If you have questions regarding other floor plan styles at Exchange, please contact us immediately at 604-879-3200. The Exchange Sales Team will be available to assist you through every step of the purchase procedure. Once you have arrived and selected an available suite, you will enter into a Contract of Purchase and Sale. An initial deposit in the amount of $10,000 is required at the time of signing your contract, payable to: Macdonald Realty Ltd. In Trust. Certified cheques or bank drafts will only be accepted. As a courtesy to other Exchange condo Vancouver Registrants, we ask that all purchase considerations be dealt with prior to your appointment date. Please ensure attendance of all relevant parties and decision makers on Saturday, as we would not be able to entertain subject conditions, hold or reserve any units. We will also allow one hour per contract, so please come prepared with your questions, or contact us prior to Saturday to answer as many questions as possible. Due to the anticipated velocity, we have added additional support staff. We thank you in advance for your patience and cooperation as we anticipate a line-up. Again, we recommend that you arrive early and dress for the weather. Light refreshments will be served. Congratulations to all the new homeowners at Exchange Lofts who acted quickly and took advantage of the First Release Event in November. We quickly sold out of our first release of suites, and the Exchange False Creek Presentation Centre is closed until early 2008 when we will be re-opening of our second release. Should you have any questions, or would like to put your name on a VIP list for our next release, please leave a message at 604-879-3200. Otherwise, we will contact you again in early 2008 regarding priority events next year. On behalf of the developer, PCI, we wish you a very enjoyable holiday season. Originally constructed at the turn of the 20th Century, as the very first BC Telephone Company building, Exchange condo lofts will convert this charming, four storey heritage brick building into a city-savvy contemporary loft homes. A new six storey Exchange Southeast False Creek building residential will be built alongside for a total of only 68 loft Vancouver residences allowing home buyers to choose between brand new or heritage. Truly it’s “In with the Old, and In with the New.” Exchange Lofts in Southeast False Creek Vancouver is located at the corner of West First Avenue and Wylie in the heart of Vancouver’s up and coming South East False Creek neighbourhood. The Exchange Lofts presentation centre opens soon, so to receive more information and to be sure you’re on of the first to see for yourself, call 604.879.3200, or you can visit the website at www.exchangeliving.com for details about the Southeast False Creek Vancouver Exchange Lofts condo residences. EXCHANGE LOFTS FALSE CREEK VANCOUVER COMING EARLY FEBRUARY! Sophisticated loft residences coming to Southeast False Creek this February! Upscale finishings include integrated Italian-imported kitchens by Dada, finished concrete floors, appliances by AEG, Blomberg & Frigidaire... worth the short wait! FLOOR PLANS - By Friday afternoon, we will have all the Vancouver’s Exchange floor plans available for viewing on the web site, www.exchangeliving.com We will also have a full list of finishings and features. You’ll discover that the suites are highly functional, ranging from 441 to 1,619 square feet and all have over-height ceilings. You’ll also see that each of the Exchange Lofts floor plans indicate whether the plan is located within the original heritage building, or if it is located within the new, heritage-inspired concrete-constructed building. Your Exchange loft choice: heritage or new! Prices start from $354,900 to $1.6m. For more information on prices, please contact us at 604-879-3200. Special Invitation to Preview Exchange Historic Modern Loft Residences in Vancouver! PCI, the real estate developer of Exchange Southeast False Creek Lofts is proud to introduce sophisticated loft living in Vancouver’s False Creek neighbourhood. A boutique sized real estate development consisting of 32 heritage and 36 brand new loft residences. Full restoration of a beautiful 95-year old, 4-storey heritage building, with original brick walls, exposed Douglas Fir wood beams and refurbished windows. Adjoined to a brand new 6-storey, concrete constructed Exchange False Creek building. Located within the emerging and sustainable Southeast False Creek community, close ot the water, downtown Vancouver and Granville Island. Functional, spacious Exchange Vancouver residences ranging from 446-1,619 sq ft with finished concrete floors, and over-height ceilings. Exclusive Italian imported Dada kitchen systems with integrated sinks and backsplash. High-performance appliances by AEG, Blombert and Frigidaire can be found at the False Creek Exchange Loft Residences. As a real estate project registrant, we cordially invite you to a privileged preview opportunity before the Presentation Centre is open to the general public, and well before sales commence on February 23rd. Come visit the Exchange Lofts Presentation Centre and see our fully-furnished display suite, located within the original heritage building! On these preview dates, we will also be advising on early purchase opportunities. Note: if you prefer another date/time other than tehse indicated here, please call for a personal appointment! Priority preview dates: Tuesday, February 12th, Wednesday, February 13th and Thursday February 14th. Times between 3pm to 7pm. Place at the Exchange Lofts Presentation Centre at 1940 Wylie Street (at West 1st Avenue) in Vancouver. RSVP requested for acceptance only to info@exchangeliving.com. In view of the limited number of residences at the Southeast False Creek Exchange lofts and residences, highly desireable location and rare heritage residences, and the current over subscription of existing registrants, we anticipate that the 68 residences will be selected and purchased in a short period of time. Please express your interest early. For more information on Exchange Lofts in Southeast False Creek Vancouver, please contact us directly by calling 604.879.3200. Exchange is Making Headlines! Now Open Daily! We are pleased to announce that Exchange’s Presentation Centre with a full 'New World' display suite is now open for public viewing. We’re open daily from 12 noon – 5pm (except Friday.) With only 68 Exchange False Creek suites, and a completion date set for Spring 2009, we encourage you to visit us soon! Ask us about special financing opportunities, and why Exchange is the best style and Westside value in the legacy-destined Southeast False Creek waterfront community! If you missed the Vancouver Sun on Saturday, click here to read up on what Vancouver Sun West Coast Homes writer Kim Pemberton had to say about Exchange. Pick up your current edition of the New Home Buyers Guide on local newsstands where you’ll see Exchange featured on the front cover, as well as a feature profile! You can click here to read the article on-line. Catch The Express on Shaw TV Cable 4 and join local personality Amy Beeman on a tour of the Exchange Presentation Centre and Display Suite on the Canada Home Guide's Open House! Aired several times daily. Welcome to The Art of New Living!